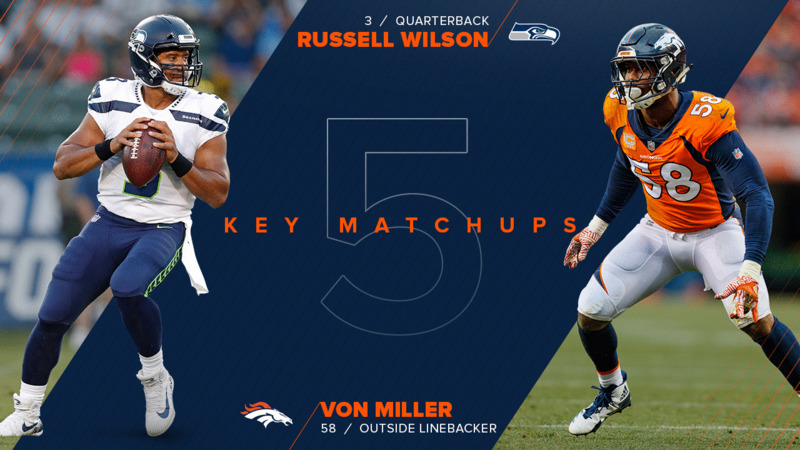 Von Miller will hope to pressure Russell Wilson all afternoon, but that's just one matchup to watch on Sunday afternoon in Denver's season opener. Miller is one of the best edge rushers in league history. Wilson is one of the best scramblers in league history. That makes for an exciting cat-and-mouse game between two of the finest at their craft. Miller notched one sack on Wilson in their only previous regular-season meeting, a 2014 Seahawks victory. With Bradley Chubb, Shane Ray and Shaquil Barrett all viable pass-rush options opposite Miller, Wilson will have to have his head on a swivel. Pressuring Wilson is one thing, but bringing him down is another: His 586 rushing yards were second-most among quarterbacks last season. He played a role in 37 (34 passing, three rushing) of the Seahawks’ 38 offensive touchdowns last year. Miller’s 83.5 career sacks are second-most in team history, and he’ll be looking to inch closer to Simon Fletcher’s franchise record of 97.5. Doug Baldwin operates primarily from the slot, the same area Chris Harris Jr. has defended as well as anyone over the past half-decade. Baldwin and Harris both entered the league as undrafted free agents in 2011, stand 5-foot-10 and have a Super Bowl ring. Their matchup on Sunday will be a particularly key one: No one has caught more passes or seen more targets from Russell Wilson over the past four seasons than Baldwin, and he’s certainly going to be a big part of the game plan, even though a knee injury limited him during the preseason. He is very physical at the line of scrimmage and able to get separation both underneath and down the field. His 18 catches of at least 20 yards ranked tied for eighth in the NFL last year. Harris, meanwhile, could be charged with limiting him. A three-time Pro Bowler, Harris was again one of the best corners in the league in limiting catches and yards to opposing wideouts last year. If Harris can take away Wilson’s top target, that will allow the Broncos’ pass rush extra time to attack the quarterback. This is a battle between two rookies that will likely determine how the Broncos’ offense script goes. Freeman, fresh off a strong preseason, was officially promoted to the starting running back roleon Monday. After four strong years at Oregon, Freeman is the first rookie running back to open the season as starter for Denver since Terrell Davis. On the opposite side is Griffin, a rookie linebacker out of UCF who is missing his left hand and whose brother, Shaquill, plays cornerback for Seattle. More than a feel-good story, Shaquem led the Seahawks with 26 preseason tackles and is poised to start at linebacker in place of K.J. Wright, who is recovering from knee surgery. Seattle ranked 19th in rushing yards allowed per game last year, so the Broncos will look to take advantage there. In his first NFL game, Chubb gets a stern test: four-time Pro Bowl left tackle Duane Brown. But a matchup like this will also give Chubb, who recorded 20 sacks over his last two years at NC State, the opportunity to show his first-round talent. Chubb registered nine total tackles, a half-sack and a safety in three games this preseason, and he has improved as he’s become acclimated to the pros. He’ll have an opportunity to show that improvement against Brown, who was traded from Houston to Seattle mid-season and still turned in a Pro Bowl campaign. At 33, Brown’s 142 career games heading into this contest is a stark contrast to Chubb’s zero, and the battle of old vs. new will be one to keep an eye on when the Seahawks have the ball. This matchup pits two up-and-coming players. Clark, entering his fourth year, has 19 sacks over his past two seasons. The Seahawks lost two pieces of their starting defensive line from last year — Michael Bennett is in Philadelphia and Sheldon Richardson is in Minnesota — so Clark will be counted on to produce against both the run and the pass. Playing in all 16 games for the first time, Clark registered a team-high 9.0 sacks last year, and he’ll be looking to build off that. Bolles could be tasked with slowing Clark down. The Broncos’ 2017 first-round pick started all 16 games for the Broncos last season as a rookie but struggled with penalties at times. But Bolles is feeling much more comfortable in his second year and should show improvement next to left guard Ron Leary. “Before the snap of the ball, we’re always communicating,” Bolles said during the preseason. “I like where we’re at.” That duo will be key in keeping Case Keenum’s jersey clean.